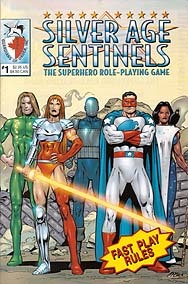 Silver Age Sentinels focuses on what heroes do best - being heroes. The four-colour pallet isn't an excuse to ignore life's rainbows of greys; rather, it deliberately focuses on what makes folks better men and women without belittling the soul or trivializing the human spirit. Heroism isn't a matter of cosmic abilities or cool costumes; heroism is strength of character and the power of compasion. Heroism exists in that solitary atom, that final 1% of someone's tattered strength when they surrender ego for the well-being of others, regardless the cost to themsleves, and become a beacon.